A radically ground-breaking investigation of mental distress in the spaces of the modern world has just been published by Winter Oak Press. 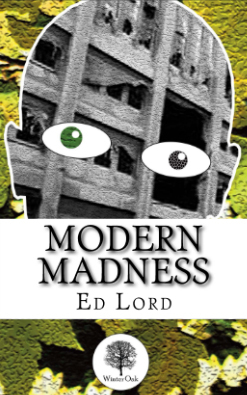 In Modern Madness: A Wild Schizoanalysis of Mental Distress in the Spaces of Modernity, talented new author Ed Lord opens up some fundamental questions for analysis. What are we to make of an age that delivers pandemic levels of mental illness and a physical environment at the point of catastrophic collapse? What is it that connects and infuses both modernity and psychiatry to make them seem like the only possible ways to organise our lives and aid our distress? Could there be other options available? Other ways to explain and ameliorate our distress? What if mental distress is considered as much a matter of geography as it is of personal pathology? The philosophical legacies of Felix Guattari and John Zerzan are employed to take the reader on a profoundly challenging walk through Critical Theory, anarchy and decolonisation to create a route to sanity via a wild-schizoanalysis. Drawing upon a professional background in acute psychiatry and a personal immersion in radical environmentalism the author introduces us to the opening salvo of a wild and undomesticated way to think about the personal and global issues we face. “As a smile appears or a chuckle bursts forth grand narratives of ‘progress’ are seen for the farce that they are, cracks appear in the colonial project and modernity can appear as just one story among many”.